Michigan Technological University's Great Lakes Research Center was the site for the unveiling of the Marine Autonomy Research Site (MARS)–the first freshwater testbed of its kind in the world–Friday, Aug. 10. 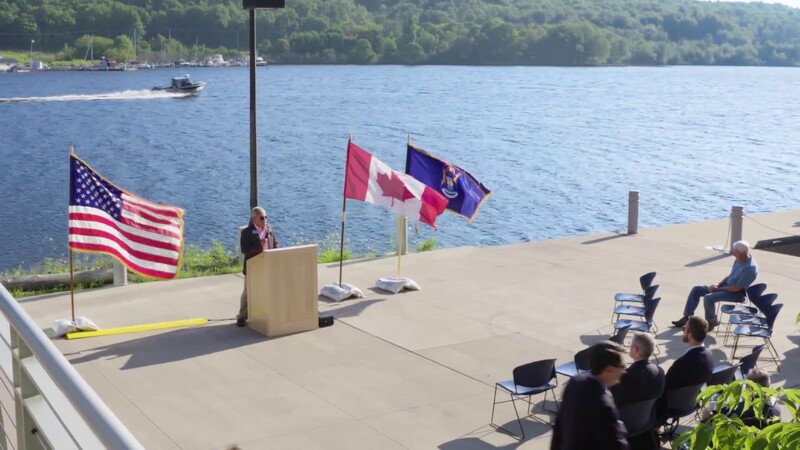 The unveiling of MARS was held in conjunction with the launch of the Smart Ships Coalition, designed to study and set ground rules for the use of autonomous marine vehicles on the Great Lakes. The coalition is made up of scientists, policy makers, resource managers, innovators, navigators and educators that share a common interest in the advancement of autonomous technologies in marine environments. Representatives of many of the coalition's partners were on hand for Friday's launch ceremony, hosted by Guy Meadows, director of the Great Lakes Research Center (GLRC). Meadows said autonomous marine vehicles are the future and "we get to set the future." U.S. Rep. Jack Bergman said, "This center puts us on the cutting edge. And if you're not on the cutting edge, you're behind." Among the coalition's partner organizations is the Great Lakes-St. Lawrence Governors and Premieres, chaired by Governor Rick Snyder. The group's Executive Director David Naftzger said, "Shipping will look different in 25 years. Largely because of the work done here." Also participating in the launch were Michigan Tech President Richard Koubek; Jon Allan, director of the Michigan Office of the Great Lakes; State Senator Tom Casperson; State Representative Scott Dianda; Kevin Kohlmann, director of the Office of Safety, U.S. Maritime Administration; Bruce Kelly, policy advisor for Transport Canada; Lt. Abbie Lyons, U.S. Coast Guard Marine Safety Unit, Station Duluth and representatives from the offices of Governor Rick Snyder and U.S. Senators Debbie Stabinow and Gary Peters. Travis White (GLRC) explained how autonomous marine vehicles are already being used. His Houghton company, Pro Nav Marine, manufactures a buoy used for sailboat racing. "It uses GPS and satellite technology, so not only can the buoy be remotely placed to change a race course, it can also remain stationary without an anchor." Following the launch ceremony, there was a live demonstration of state-of-the-art autonomous marine technologies and opportunities to tour the GLRC. The MARS test-bed will allow collaborations between technology developers, university researchers, resource managers and industry to meet the future challenges in marine technology development, application and workforce creation. MARS is the first freshwater site of its kind in the world.